Denny Hamlin and the FedEx Racing team recorded a 15th-place finish Saturday night at Texas Motor Speedway. Hamlin, who swept both races at Texas in 2010, fought a loose race car throughout the 334-lap event, lost a lap to the leaders during a long green flag run in the race’s midpoint and never got a timely caution while in position for the “lucky dog.” Carrying a special FedEx Office/March of Dimes paint scheme, Hamlin was the highest-finishing Toyota driver in the race. The 15th-place result dropped Hamlin one spot to 20th in the NASCAR point standings following Texas, 82 points behind leader Carl Edwards. The Sprint Cup Series heads to Talladega (Ala.) Superspeedway this weekend for Sunday’s 188-lap event on the 2.66-mile high-banked oval. In 10 career Talladega starts, Hamlin has recorded three top-five and four top-10 finishes. His best result of third came in the spring 2008 event, and he finished in the top-10 in both races at Talladega in 2010 — fourth in the spring and ninth in the fall. The Chesterfield, Va., native has led at least one lap in all 10 of his starts at Talladega, and has led more than 10 laps in six events, including 17 laps one year ago. 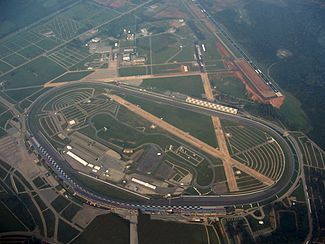 In total, Hamlin has led 196 laps at NASCAR’s longest track, with an average finish of 18.3. The #11 Toyota will carry a special paint scheme for the second consecutive weekend, as the familiar black and blue FedEx Office colors turn blue and white to coincide with the “Print Big, Save Big” sale currently running at all FedEx Office locations. The Orlando South FedEx Office district is currently the best performing district in the “Print Big, Save Big” promotion and will have its “0110″ numbers on the b-post of the #11 FedEx Office Toyota this weekend. Do you think Talladega owes you a win after leading so many laps at the track? “You can never expect anything at Talladega other than you are going to need a great car and a good amount of luck. We’ve improved so much here over the years and we now come to Talladega thinking we can run up front and our record here shows that we can. It’s a matter of getting that strategy just right so when the time comes you know you are ready to go. If we can keep our car out of trouble at Talladega, I think we’ll have as good of a chance as anyone to win there. Was your best chance to win at Talladega last spring?